Did you watch game 6 of the World Series last night? Amazing! I’m pulling for the Rangers, but was floored by the Cardinals repeated comebacks. However, the 11 inning ballgame caused me to stay up till 1, miss my last bus home, and is now on my mind. Game 7 is tonight, and while I don’t think it can top game 6, I’m prepared for a hard-earned Rangers victory! Until that first pitch at 8:05 eastern, enjoy 7 Churches in Dallas and St. Louis for 7 Quick Takes. For extra fan points, can anyone point out the significance of the ordering? For those of you now wandering by, the ordering was based on where the games of the 2011 Fall Classic were played. The Cardinals had home field advantage, so the first two games were played in St. Louis, the next three in Dallas, and the last two in St. Louis. Alas, after a dramatic game 6, the Rangers lost in a mundane game 7. Established in 1843 by Jesuit missionaries, the Shrine of St. Joseph later became associated with several miracles. One is called the St. Peter Claver’s Miracle due to his intercession in curing a man who had been crucially debilitated by an iron spike. The second is known as the Altar of Answered Prayers. During a cholera outbreak in the 1860, several parishioners gathered at the church to ask for St. Joseph’s intercession, in turn pledging a large sum of money towards erecting a monument for him. 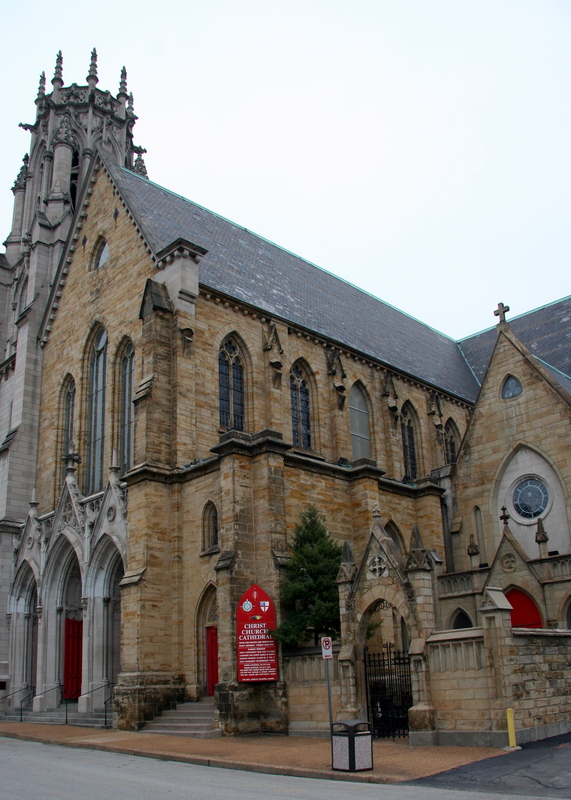 Built between 1859 and 1897, Christ Church Cathedral is affiliated with the Episcopal Church. As you can see below, the church is heavily influence by the Gothic look, which reflected a return to some of the more traditional practices in the Episcopal Church at the time. 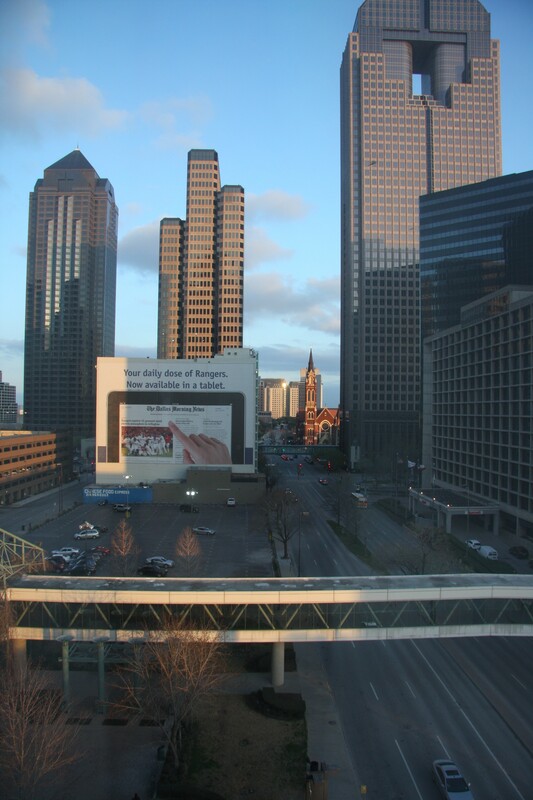 Those of you who have been following this blog for a while may remember my trip to Dallas this past March for a conference. While there, I was excited to see that the Cathedral Shrine of Our Lady of Guadalupe would be located nearby. Imagine my surprise when I checked into my room, and it was right outside my window! This church has the second largest parish community in the US, and as I recall from when I visited, offers 7 Masses alone on the weekends, both in Spanish and English. 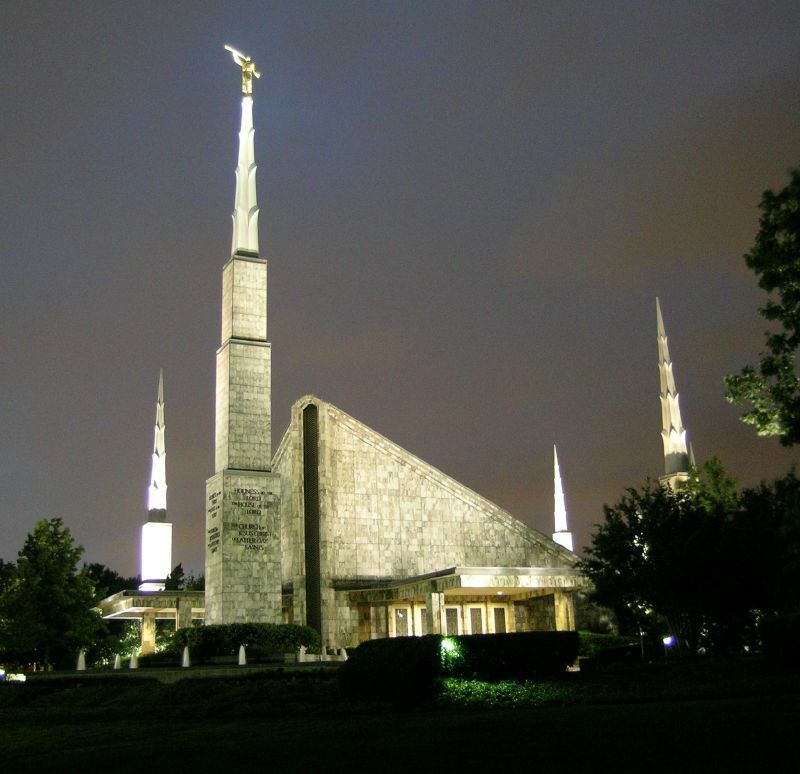 Built in 1984 to accommodate the local LDS community, the Dallas Texas Temple was remodeled in 1987 following a large increase in membership. The temple is built according to the sloping roof style with six spires – a common layout in the 80s and early 90s. 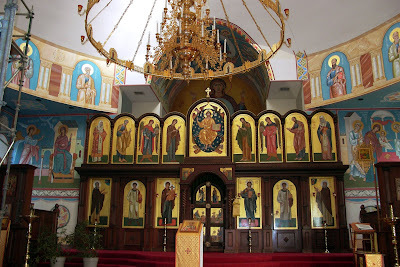 I’ll admit that I don’t know much about this church, but I do know that the eloquent and thoughtful writer of evlogia attends St. Seraphim Orthodox Cathedral, and has posted beautiful pictures of the interior. Their archbishop recently passed away at the end of August; you can read about his life here. St. Stanislaus Kostka has a controversial history in the area. Built in 1880 to serve the local Polish Catholic community, the church is now considered in schism and thus excommunicated from the Catholic Church. The disputes in this matter are over who runs the operations (the bishop versus the board of directors) and has lasted from the early 1900s until 2005, when Archbishop Burke (as then-Archbishop of St. Louis) canonically suppressed the church. It still thrives as a parish community, although it has started taking on unorthodox, un-Catholic positions, like ordination of women and married priests. Not a church, but a Jewish synagogue. 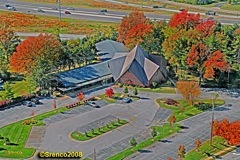 The most unique feature of Temple Emanuel is its shape – from overhead, it looks like a Star of David. You can see it a bit below. It’s the building on the far right, with a longer hall coming out of it. What a great post idea! 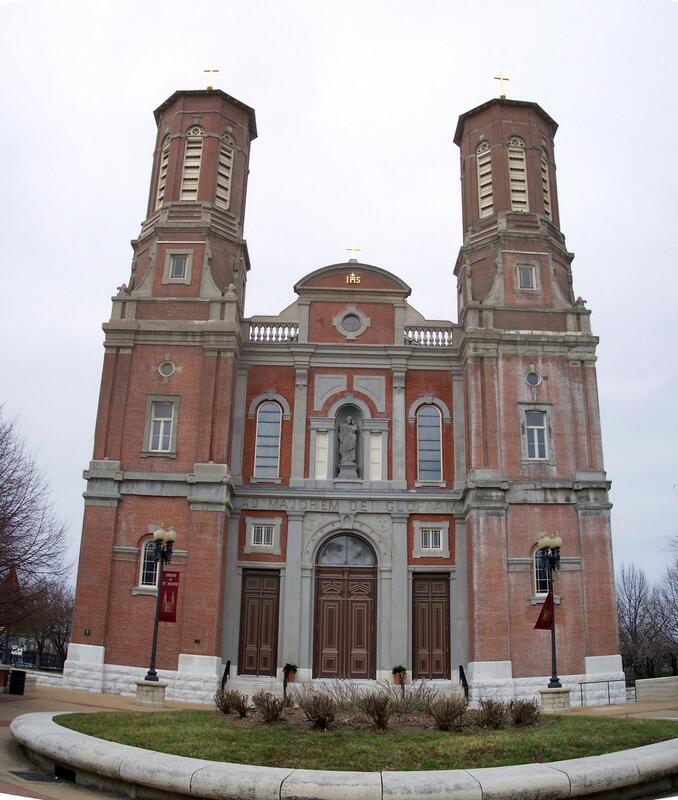 I visited the St. Joseph Shrine when I lived in St. Louis, but had not heard about Temple Emmanuel. The two Catholic cathedrals (old one near the Arch, new one full of mosaics) are my favorite churches there. As someone who also loves to photograph church architecture, I am very glad I found your blog! Well, you picked the church order based on which team has won:) And I am GREATLY disappointed that you did not choose a Dallas Church as #7! But all is fair in love and war as long as the Rangers win:) Enjoyed your post! Enjoy game 7!